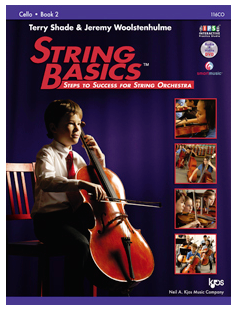 String Basics™ Book 2 has been praised for the smooth transition from pizzicato to arco, the solid reinforcement of skills learned, the detailed attention to rhythm, and the fantastic selection of songs. Continuing with a strong and sound pedagogy featuring step-by-step sequences of instruction, Book 2 begins with a solid review in order for students to get a firm footing so that new concepts fall right into place. New note values, rhythm patterns, key signatures, finger patterns, and dynamics are introduced and reinforced with fantastic technical exercises, cultural music, and classical themes.